Bootie LA – Pizza Party! Los Angeles Bootie LA – Pizza Party! With Two Boots Pizza right upstairs, it only makes sense for Bootie LA to throw ... a Pizza Party! Free slices of pizza throughout the night to help your drunken hunger and the best mashups to dance off those cheesy calories! Only $5 before 10 PM! Free pizza slices throughout the night from Two Boots Pizza! With Two Boots Pizza right upstairs, it only makes sense for Bootie LA to throw … a Pizza Party! 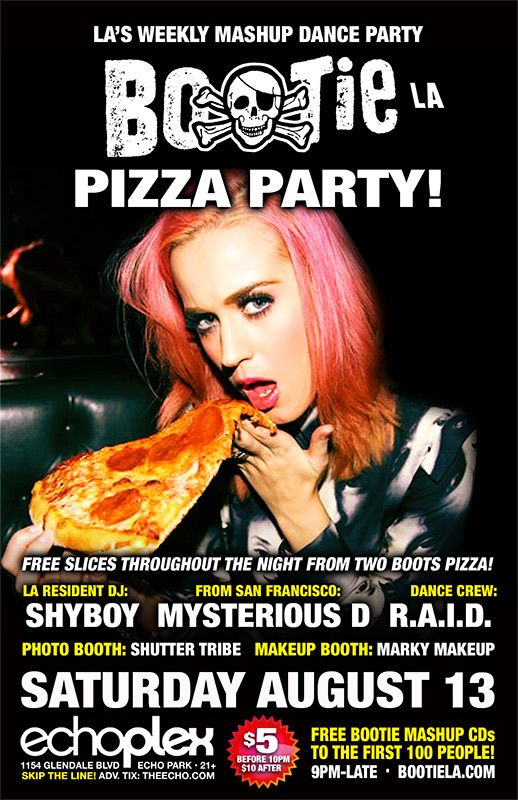 Free slices of pizza will be randomly given away throughout the night, as Bootie co-founder DJ Mysterious D comes down from San Francisco to join resident DJ ShyBoy in spinning the best mashups in the world. Dance those cheesy calories away! Resident dance crew R.A.I.D. (Random Acts of Irreverent Dance) will fill the stage with their usual go-go antics, while Marky Makeup gives your bodies a pizzarific makeover, and Shutter Tribe captures all the fun! All this, plus FREE Bootie mashup CDs for the first 100 people through the door!